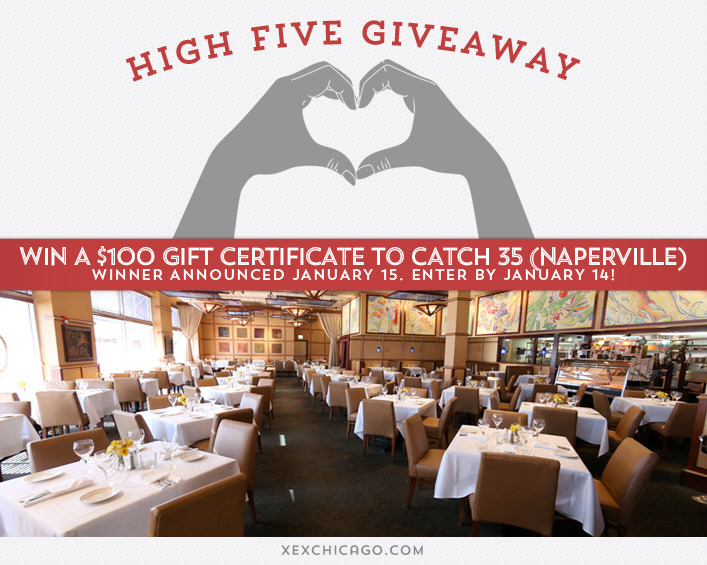 Win a $100 Gift Certificate to Catch 35 (Naperville)! Congratulations to Matt Wilborne on winning our fifty seventh High Five Giveaway and thank you to all who entered! Our next High Five Giveaway is for a $100 gift certificate to Catch 35’s Naperville location. Catch 35 is located at 35 South Washington Street, Naperville. Their phone number is 630-717-3500. Visit their website at www.catch35.com. One of our recent blog posts provided some health and beauty New Year’s resolutions. What are one of the resolutions we suggested? Now, just add a comment to this post with the right answer to be eligible to win! The winner will be announced on Wednesday, January 15. Entries must be received by midnight on Tuesday, January 14. Cut the stress! ^_^ No stress, no grey! Cut some stress out of your life! Go Green with Your Products! Go green, reduce stress and eat healthy! To eat more brown rice, salmon and eggs which are also healthy for your hair. Go Green! I already have and couldn’t agree more. Was even info in the blog I didn’t know. Thnx for the info & educating us! Eat Good, Look Good! Healthy foods and plenty of water are key! Chia Seeds & Kale are staples in my kitchen.